Seche has developed patented, revolutionary technology known as the Seche Vite Dry Fast Top Coat. 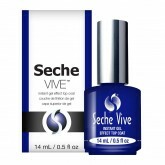 Se..
Bring your manicure to life with Seche Vive Instant Gel Effect Top Coat. This specially formulated f..